Waiting to scare the trick-or-treaters who dare to go through the Haunted Hallway. Junior Maryn Monet, seniors Jenna Burns and Maddie Blonde are hoarding the candy. Dracula is ready for Project Pumpkin. Matthew Bruzzese and John Ellard riding their ostriches. photo by Arianna Esposito. Seniors Meghan Dion and Lexi Nastasia selling baked goods at the Guatemala bake sale. Pirate plays game in the gym. photo by Danting Zhu. Cinderella is ready to do some trick or treating. Trick or treaters got to fill their bags at stations in the hallways. Nick Visconte and Andrew Evans photo by Ari Esposito. There were plenty of lollipops for everyone! Ms. McDonough’s son James is having a ball at Project Pumpkin. A close-up of an interesting costume. Seniors Jenna Burns and Maddie Blonde along side junior, Maryn Monet. On Sunday, Oct. 28 from 1-4 p.m. families from Rockland and surrounding towns filed into the Rockland High School lobby to partake in annual RHS Halloween tradition, Project Pumpkin. Here, families paid $3 per child, or $2 if a canned good was donated, in order to trick or treat through the RHS halls, Also available was a venture down the Haunted Hallway, and enjoyable games in the gym. On top of the fun and candy, both the SGC and the students involved in the 2019 Guatemala trip held their own bake sales with home baked goods ranging from chocolate chip cookies, whoopie pies, and rolo pretzels. All in all, both the students and families had a day filled with frightening fun that served to connect Rockland High School to the community. Photo credits to junior, Arianna Esposito and here is a link to our video shot by sophomore, Alexxys MacDonald. Don’t Forget to Go Trick or Treating at RHS on Sunday Afternoon! Rockland’s Student Government Council will be holding its annual Project Pumpkin on Sunday, Oct. 28. Families are invited to attend between 1 p.m. and 4 p.m. at Rockland High School. Along with trick or treating throughout the hallways at RHS, face painting, games and other activities will be available in the gym. A haunted hallway (optional) is also available. All candy is peanut free. Take a look at pictures from year’s past Project Pumpkins! Erin Kearns and Maddie Gear are Teenage Mutant Ninja Turtles: Can you see who is who? The entrance to the Haunted Hallway at Rockland High School’s Project Pumpkin. Hannah Wyllie (giraffe) and Jad Bendarkawi (Chewbacca) hand out candy to a cute witch at last year’s Project Pumpkin. 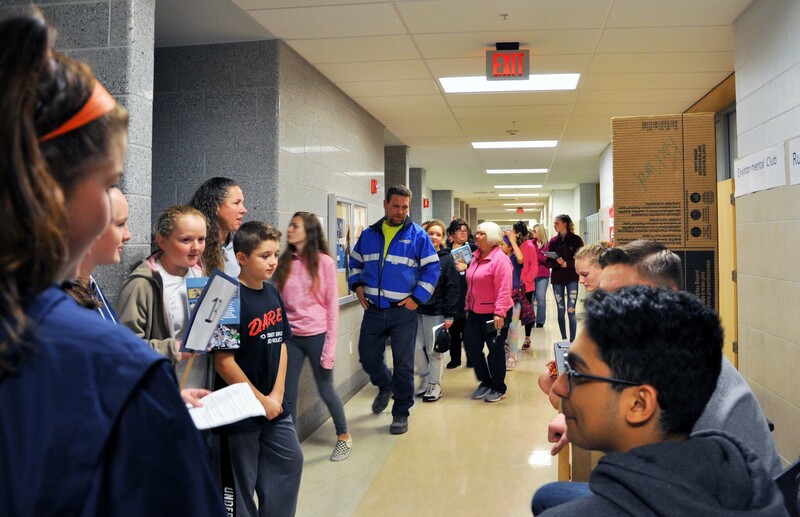 One of the “tour groups” being guided through the hallways at the Open House on Weds.night, Oct. 24. The Open House held on Weds. Oct. 24 welcoming eighth graders and their parents showcased not only the many programs found at Rockland High School, but more importantly, the enthusiasm of student volunteers who served as tour guides and demonstrators for the many clubs, and academic programs that were set up and highlighted throughout the building. According to Principal John Harrison, over 60 student volunteers and 30 staff members participated in the RHS annual Open House and Welcome Night for the RHS Class of 2023 students. Each academic department set up demonstrations while all the clubs that the high school offers were showcased as members had set up tables with examples and demonstrations of what the club’s purpose and activities were. The Open House began with a presentation in the auditorium where a powerpoint presentation on the “Top 10 Best Things About Rockland High School” was shown. Then parents and students were divided into tour groups and were conducted through the hallways by students where they visited the many tables set up. Most of all, it was Rockland High School students who enthusiastically led the demonstrations and explained the programs that RHS provides. Veritas photographer Danting Zhu found many of the activities in the hallways. Hannah Wylie and Jad Bendarkawi at the Environmental Club and Rubik’s Cube table. Lexi Coulstring and Pietra Dasilva. Paige Boggs with the robot. Mrs. Donovan in the cooking room. Welcoming the Class of 2023! 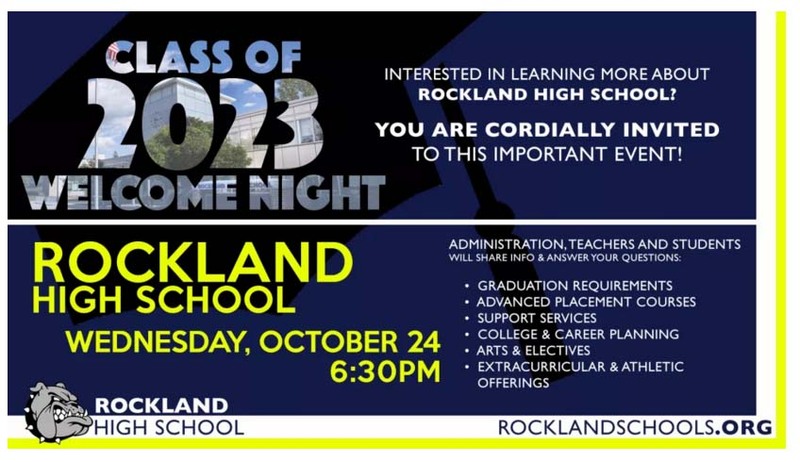 On Wednesday night, Oct. 24 from 6:30 to 8 p.m. the Class of 2023 students and parents are invited to attend a Welcome to Rockland High School Night. In the format this year teachers, students and administrators will showcase for 8th graders and their parents the various programs and people that make up Rockland High School and Bulldog Nation! Demonstrations set up in the hallway including science and engineering demos including robotics, cooking demos, wood shop demos and more. A display table with magazines from prior years of Images art and literary magazine and the Veritas, the high school newspaper. Students from athletic teams explaining the various sports available at RHS. 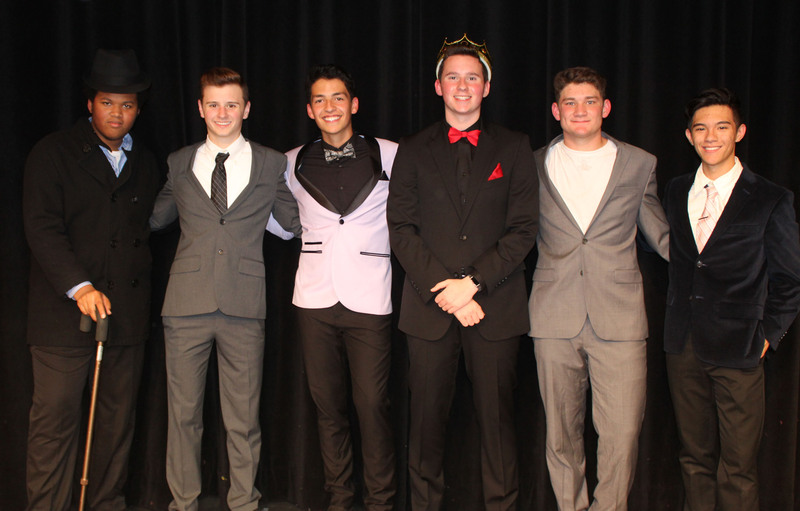 Senior John Ellard was crowned Mr. Rockland on Weds. Oct. 17 in the annual Mr. Rockland competition sponsored by the RHS Student Government Council under the direction of senior Jasmin Morse. Ellard was judged the top competitor by four faculty judges, Kendra Donovan, Adrienne Donovan, Rich MacAllister and Fred Damon. The other contestants included: Matt Dalton, Sean Morrison, Giovan Soares, Justin Sherlock and Francisco Oliveira. The contest included talent, lip-sync, formal wear and question and answer. To read more about the contestants and the competition see our next issue of the print edition of the Veritas due out next week. Photos below were taken by Veritas photographer Arianna Esposito. Check back tomorrow for some video clips from the Mr. Rockland competition! 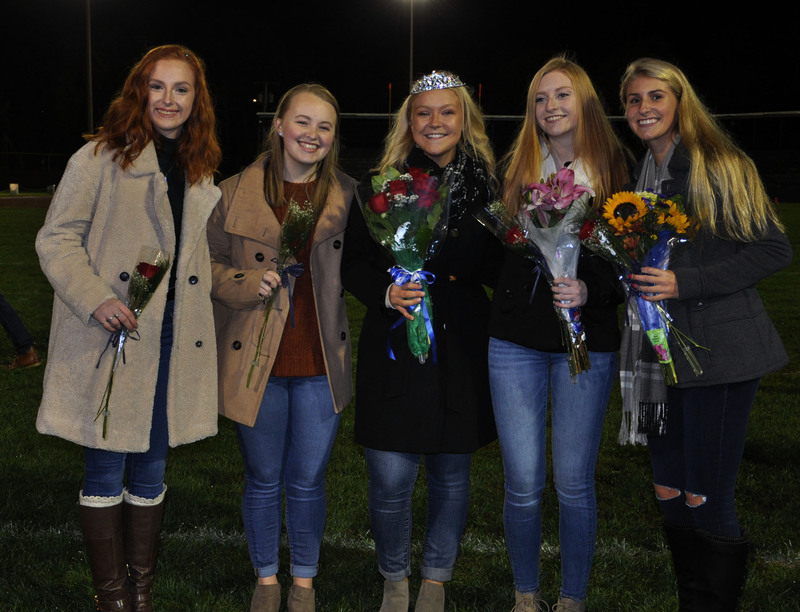 Five senior girls were introduced to the fans at half-time of the Oct. 12 Homecoming Game as the nominees for Miss Rockland for this school year. They are Alyssa Antoniewicz, Kathleen Burke, Caitlin Cameron, Meghan Dion, and Jasmin Morse. The girls were nominated by faculty and staff at RHS; the senior class voted for Miss Rockland. Nominees are seen as positive role models, academically sound, and respected by faculty and their peers. In all, they make Rockland a better place to be. Meghan Dion was crowned by Principal John Harrison as the 2018-19 Miss Rockland. For more about each of the Miss Rockland nominees, check out our story in the print edition of the Veritas due out next week. Jasmin Morse and her parents, Jill and Adam. Meghan Dion with her parents, Lynne and Kevin. Caitlin Cameron with her mother, Maureen and her father, William. Miss Rockland nominee Alyssa Antoniewicz with her mother, Cheryl, her father, Al and her brother Eric. Rockland and Abington had their annual Unified Soccer game last night, Oct. 10. A good time was had by all! !photo courtesy of Mr. Graziano. At the Abington Frolio field last night, on Wednesday Oct. 10 Rockland’s Pathways program students participated in a unified soccer game against AHS’s special education program. The event was planned by RHS Athletic Director, Gary Graziano in coordination with Abington’s athletics. Here, the athletes from both the pathways program, RHS boys and girls soccer teams came together for a night of fun and fitness.